One of those things many runners and other athletes are always trying to improve is their VO2max. Shockingly, this also happens to be true of jogglers. What is VO2max? It is our maximum oxygen uptake, or aerobic capacity, or the amount of oxygen an athlete can use. It is one of the most important determinants of athletic performance, since a high VO2max means you won’t run out of breath too quickly, among other things. Elite endurance athletes tend to have a very high VO2max, while sedentary people have low ones. : High-aerobic intensity endurance interval training is significantly more effective than performing the same total work at either lactate threshold or at 70% HRmax, in improving VO2max. The changes in VO2max correspond with changes in SV, indicating a close link between the two. I realize this isn’t anything new. I can just hear the seasoned athletes reading this exclaiming: “I know this already!”. Indeed, it was high intensity interval training that allowed Roger Bannister to break the 4 minute mile in 1954. Even today, many runners use this method to improve speed and endurance. This may be well known, but for people new to running this info is important. 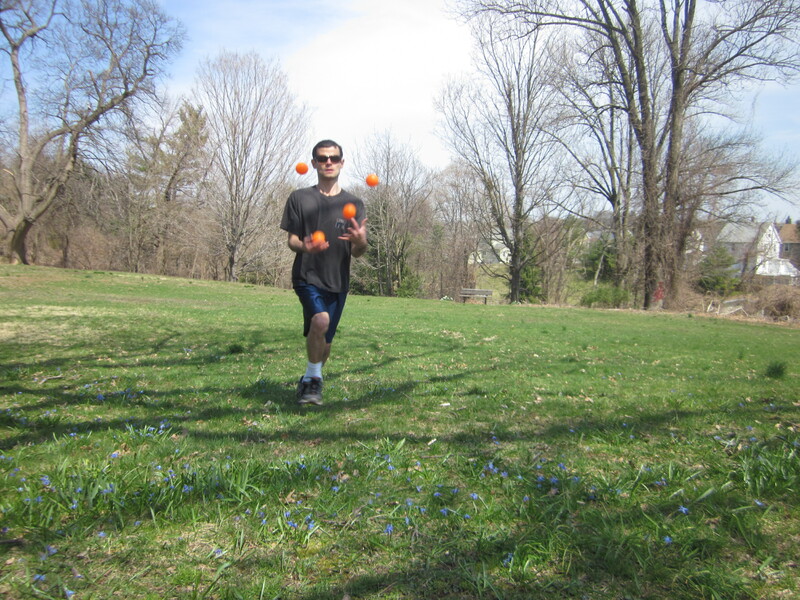 However, if you’ve never tried joggling before, you may be curious to know just how much stamina is required to run and juggle at the same time(I don’t have any actual numbers, but it does require “significantly” more stamina than running). If you take up joggling, your VO2max will play a very important role in how well you do, besides your coordination. 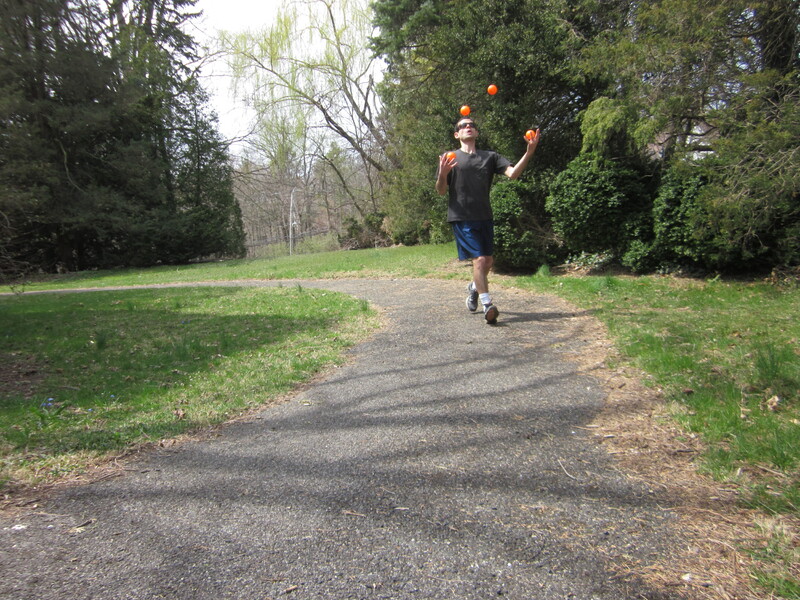 When I first started learning to joggle, I very quickly tired out after about 30 seconds(not to brag, but today I joggled 3 balls for 35 minutes without a single drop, but dropped the balls several times while doing 4 ball joggling). I just didn’t have the stamina. I don’t know what my VO2max was when I was just a runner, but I’ll bet anything it is much higher now as a joggler. Joggling 3 balls isn’t as much of a challenge as it used to be. So I’ve been doing 4 ball joggling, which requires even more stamina since my arms have to be even faster. I think my VO2max may be improving slightly due to my 4 ball joggling training, but I rarely go beyond 40 seconds joggling 4 balls without dropping. Just so that you know, few things will make your heart pump faster than the early stages of joggling. I admit that it has even scared me a little. But this doesn’t happen anymore, I think my heart has adapted. Once your juggling technique is solid, after joggling for many miles your legs will feel the burn more than your arms. This entry was posted in fitness, joggling, running, trails/outdoors and tagged 4 minute mile, breaking 4 minute mile, cardio, endurance cardio, endurance running, improving endurance, improving stamina, joggling 3 balls, joggling 4 balls, joggling cardio, juggling 4 balls, lower Westchester, Roger Bannister, VO2max, westchester county. Bookmark the permalink. Thanks for dropping by and liking my post on the Spring Hike. Totally agree with high intensity training. I usually foloow the Tabata (20″ intense 10″ less intense for 4 mins, and recovery for 4 mins before repeating.) Do you follow a particular schedule? You’re welcome. I often change my schedule, but I often maximize my speed for a minute 3 to 5 times during 30 minutes of moderate pace running. If run for 60 minutes, I will do it maybe 10 times(I run about 5 to 6 days a week). This isn’t necessarily a recommendation though, see what works for you. Just make sure you don’t feel too tired after. Thanks for coming by.